In this part of the series, we focus on DoS/DDoS attacks, which have been among the major threats to Web servers since the beginning of the Web 2.0 era. The goal of a Denial of Service (DoS) attack is to disrupt some legitimate activity, such as browsing Web pages, email functionality or the transfer of money from your bank account. It could even shutdown the whole Web server. This denial-of-service effect is achieved by sending messages to the target machine such that the “message” interferes with its operation and makes it hang, crash, reboot, or do useless work. In a majority of cases, the attacker’s aim is to deprive clients of desired server functionality. One way to interfere with legitimate operations is to exploit vulnerabilities on the target machine or application, by sending specially crafted requests targeting the given vulnerability (usually done with tools like Metasploit). Another way is to send a vast number of messages, which consume some key resource of the target machine, such as bandwidth, CPU time, memory, etc. The target application, machine, or network spends all of its critical resources on handling the attack traffic, and cannot attend to legitimate clients. Of course, to generate such a vast number of requests, the attacker must possess a very powerful machine — with a sufficiently fast processor — and a lot of available network bandwidth. For the attack to be successful, it has to overload the target’s resources. This means that an attacker’s machine must be able to generate more traffic than a target, or its network infrastructure, can handle. Such a page, when loaded, will send the same request 1,000 times every 2 seconds, and will consume a lot of the Web server’s bandwidth. Thus, the target server will not be able to respond to other clients, and eventually, legitimate clients will be denied services from the server. Now let us assume that an attacker would like to launch a DoS attack on example.com by bombarding it with numerous messages. Also assume that example.com has abundant resources and considerable bandwidth (which is most often the case). It is then difficult for the attackers to generate a sufficient number of messages from a single machine (as in the above scenario) to overload those resources. However, imagine the consequences if they got 100,000 machines under their control, in order to simultaneously generate requests to example.com. Each of the attacking machines (compromised machines that have been infected by malicious code) may be only moderately provisioned (have a slow processor and be on a mere modem link), but together, they form a formidable attack network — which, with proper use, could overwhelm even a well-provisioned victim site. This is a distributed denial-of-service (DDoS) attack, and the machines under the attacker’s control are termed as zombies/agents. 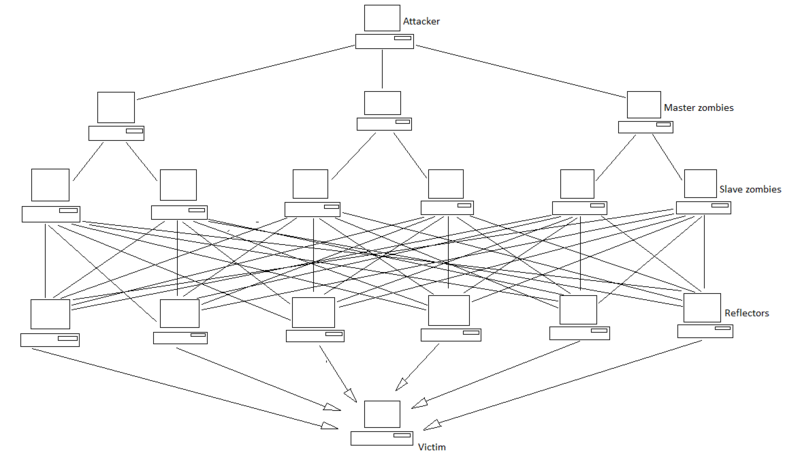 In a typical DDoS attack, the attacker’s “army” consists of master zombies and slave zombies. The attacker coordinates and orders master zombies and they, in turn, coordinate and trigger slave zombies. More specifically, the attacker sends an attack command to the master zombies, and activates all attack processes on those machines, which are in hibernation, waiting for the appropriate command to wake up and start attacking. Then the master zombies duplicate the attack commands to each of their slave zombies, ordering them to mount a DDoS attack against the victim. In this way, the zombie systems begin to send a large volume of packets to the victim, flooding it with useless loads, and exhausting its resources. In DDoS attacks, spoofed source IP addresses are used in the packets of the attack traffic. Attackers prefer to use such counterfeit source IP addresses for two major reasons: first, to hide the identity of the zombies, so that the victim cannot trace the attack back to them. The second reason is to discourage any attempt by the victim to filter out the malicious traffic. Though there are numerous flavours of DoS attacks, here we’ll discuss only those which affect the Web server and Web applications. DoS attacks often exploit stateful network protocols, because these protocols consume resources to maintain state. TCP SYN flooding is one such attack, and had a wide impact on many systems. When a client attempts to establish a TCP connection to a server, the client first sends a SYN message to the server. The server acknowledges this by sending a SYN-ACK message to the client. The client completes establishing of the connection by responding with an ACK message. The connection between the client and the server is then open, and service-specific data can be exchanged between them. The abuse occurs at the “half-open” state when the server is waiting for the client’s ACK message, after sending the SYN-ACK message to the client. The server needs to allocate memory to store information about the half-open connection, and this memory will not be released until the server either receives the final ACK message, or the half-open connection expires (times out). Attackers can easily create half-open connections by spoofing source IPs in SYN messages, or ignoring SYN-ACKs. The consequence is that the final ACK message will never be sent to the victim. Because the victim normally only allocates a limited amount of space in its process table, too many half-open connections will soon fill the space. Even though the half-open connections will eventually expire due to their timeout, zombies can aggressively send spoofed TCP SYN packets, requesting connections at a much higher rate than the expiration rate. Finally, the victim will be unable to accept any new incoming connections, and thus cannot provide services. The Internet Control Message Protocol (ICMP) is used to handle errors and exchange control messages. ICMP can be used to determine if a machine on the Internet is responding. To do this, an ICMP echo request packet is sent to a host. If a host receives the packet, that host will return an ICMP echo reply packet. A common implementation of this process is the ping application. Sending the ICMP echo request to a broadcast address triggers all hosts in the network to respond with an ICMP response packet to the spoofed address (the victim’s), thus creating a large mass of packets which are routed to the victim’s address. Networks may include up to hundreds of hosts; hence, one attack echo request results in hundreds of packets flooding the victim’s site. By patching or redesigning the implementation of TCP and ICMP protocols, current networks and systems have incorporated new security features to prevent TCP and ICMP attacks. Nevertheless, attackers may simply send a large amount of UDP packets towards a victim. Since an intermediate network can deliver higher volumes of traffic than the victim network can handle, the flooding traffic can exhaust the victim’s connection resources. Pure flooding can be done with any type of packets. Attackers can also choose to flood service requests so that the victim cannot handle all requests with its constrained resources (i.e., service memory or CPU cycles). UDP flooding is similar to “flash crowds” that occur when a large number of users try to access the same server simultaneously. Unlike typical DDoS attacks, in the case of DRDoS attacks, the army of the attacker consists of master zombies, slave zombies, and reflectors. This resembles typical DDoS attacks up to a particular point. The attackers have control over master zombies, which, in turn, have control over slave zombies. The difference in this type of attack is that slave zombies are led by master zombies to send a stream of packets with the victim’s IP address as the source IP address, to other, uninfected machines (known as reflectors), causing these machines to connect to the victim. Thus, the reflectors send the victim a greater volume of traffic, because they see the victim as requesting it. Therefore, in DRDoS attacks, the attack is mounted by non-compromised machines, which mount the attack without being aware of the hostile intent. Comparing the two scenarios of DDoS attacks, we should note that a DRDoS attack is more detrimental than a typical DDoS attack, because a DRDoS attack has more machines to share the attack — the attack is more distributed and so creates a greater volume of traffic. A DDoS attack has to be carefully prepared by the attackers. They first recruit the zombie army, by looking for vulnerable machines, then break into them (usually via Metasploit), and install attack toolkits. The attacker next establishes communication channels between machines, so that they can be controlled and engaged in a coordinated manner. This is done using either a handler/zombie architecture, or an IRC-based command-and-control (C&C) channel. Once the DDoS network is built, it can be used to attack various targets as often as desired. But, the first step for attackers is to find machines that they can compromise. To maximise the yield, they will recruit machines that have good connectivity and ample resources, and are poorly maintained. Unfortunately, many of these exist within the pool of the millions of Internet hosts. The process of looking for vulnerable machines is called scanning. The attackers send a few packets to the system, to see whether it is alive (online) and vulnerable. If so, the attackers will attempt to break into the machine. After breaking in, they will try to install malicious code, or a “bot” on the machine, which will give them complete reverse control over the machine. The attacker can repeat the scan-and-infect process to build big attack networks. The mechanism of propagating malicious code to compromised machines is classified into three types. These are given below. In this method, after discovering a vulnerable system that will become one of the zombies, the attackers take control over the system and download an attack toolkit from a different website (a central source) to the newly exploited system. After the toolkit is transferred, an automatic installation of the attack tools takes place on this system. That initiates a new attack cycle, where the newly infected system looks for other vulnerable computers on which it can install the attack toolkit, using the same process as the attackers. Like other file-transfer mechanisms, this mechanism commonly uses HTTP, FTP, and RPC (remote-procedure call) protocols. From the attacker’s perspective, such central sources can be easily identified and disabled by security professionals; hence, this method is not used much nowadays. In this mechanism, the attack toolkit is transferred to the newly compromised system from the attackers’ system. More specifically, the attack toolkits that are installed on the attackers’ system include special methods for accepting a connection from the compromised system, and sending a file to it that contains the attack tools. This back-channel file copy can be supported by simple port listeners that copy file contents, or by full intruder-installed Web servers, both of which use the Trivial File Transfer Protocol (TFTP). In this method, the attackers transfer the attack toolkit to the newly compromised system at the exact moment that they break into that system. This method differs from the previously mentioned methods in that the attack tools are planted into the compromised host by the attackers themselves, and not by an external file source. Important note: Each of these propagation mechanisms depend on the system vulnerability that’s exploited, since this dictates what system rights are enjoyed by the attackers. After the construction of the attack network, attackers use attack toolkits to specify the attack type and the victim’s address, and wait for the appropriate moment in order to mount the attack. They then remotely command the launch of the chosen attack to their zombies, using the attack toolkit, to begin the attack. The volume of traffic from a DDoS attack may be so high that the networks that connect the attacking machines to the victim may also suffer from lower performance. Hence, the provision of services over these networks is no longer possible, and in this way, their clients are denied those services. While there are numerous scripts that are used for scanning, compromising and infecting vulnerable machines, there are only a handful of DDoS attack tools that have been used to carry out the actual attacks. This tool uses a handler/agent architecture wherein an attacker sends commands to the handler (the first system compromised in the series) via TCP, and handlers and agents communicate via UDP. Both handlers and agents are password-protected to try to prevent them from being taken over by another attacker. Trinoo generates UDP packets of a given size to random ports on one or multiple target addresses, during a specified attack interval. This tool uses a different type of handler/agent architecture. Commands are sent from the handler to all of the agents, from the command line. The attackers do not “log in” to the handler as with Trinoo. This tool can perform a UDP flood, a TCP SYN flood and Smurf attacks at specified or random victim ports. The attackers run commands from the handler using any of a number of connection methods (e.g., a remote shell bound to a TCP port, and UDP-based client/server remote shells). All commands sent from the handler to agents through ICMP packets are encoded, which hinders detection. An improved version of TFN, this includes several features designed specifically to make its traffic difficult to recognise and filter; to remotely execute commands; to obfuscate the true source of the traffic, and to transport TFN2K traffic over multiple transport protocols, including UDP, TCP, and ICMP. TFN2K obfuscates the true traffic source by spoofing source addresses. This is the first DDoS tool that is controlled via IRC. Upon compromise and infection by Trinity, each zombie joins a specified IRC channel and waits for commands. The use of a legitimate IRC service for communication between attacker and zombie replaces the classic independent handler, and elevates the level of the threat. It is also capable of launching several types of flooding attacks on a victim site, including UDP, an IP fragment, TCP SYN, TCP RST, TCP ACK, and other floods. Now, due to regular security checks and patches, and signature-based IDS/IPS (Intrusion Detection/Prevention Systems), many of these tools have became less effective, and are not used by attackers. However, this has led to the next era of DDoS attacks, which is referred to as DDoS 2.0. Network firewalls today can detect the majority of flood and network DoS attacks. Many ICMP and UDP flood attacks can also be identified using intelligent packet filtering, and source and destination access-control lists. Hence, attackers today focus on application DDoS attacks, because these usually bypass most traditional network security devices. Application DDoS attacks exploit vulnerabilities in application servers or application business logic. For example, application DDoS attacks may simply flood a Web application server with seemingly legitimate requests designed to overwhelm Web application servers. An attacker may also attempt to exploit application vulnerabilities, such as sending Web requests with extremely long URLs. More sophisticated attacks exploit business logic flaws. For example, if an application’s website search mechanism is poorly written, it could require excessive processing by a backend database server. An application DDoS attack could exploit this vulnerability by performing thousands of search requests using wildcard search terms to overwhelm the backend application database. Moreover, the generation of session IDs, and the resources used to manage sessions, can often be overwhelmed if an attacker has the ability to generate a large number of session IDs. Recently, “Slowloris” has emerged as a perilous application DDoS attack. It disrupts application services by exhausting Web server connections. In the Slowloris attack, the attackers send an incomplete HTTP header, and then periodically send header lines to keep the connection alive, but they never send the full header. Without requiring that much bandwidth, an attacker can open numerous connections, and overwhelm the targeted Web server. While multiple patches have been created for Apache to mitigate this vulnerability, it nonetheless demonstrates the power of more sophisticated DDoS attacks. What makes DDoS 2.0 different? Servers provide a powerful DDoS attack platform, because they usually have greater bandwidth than a simple PC. Servers are always online, while a typical PC might go offline. Moreover, they are also rarely formatted. A Web server’s outgoing traffic is usually less monitored by ISPs, because of a common misconception that a server’s outgoing traffic is not as malicious as a PC’s. By using Web servers as zombies, attackers are even less detectable, because tracebacks typically lead to a lone server at a random hosting company. Do you recall the Wikileaks incident, when attacker groups supporting Wikileaks made DDoS attacks on servers of organisations that opposed Wikileaks? The tool that topped the suspected list of attack weapons was LOIC (Low-Orbit Ion Cannon). In the current era of DDoS 2.0, LOIC is one of the first choices of attackers. It is an open source network-attack application written in C#, which performs DoS/DDoS attacks on a target site by flooding the server with TCP packets, UDP packets, or HTTP requests. An attacker downloads the LOIC client and configures it to connect to an IRC server. The victim server gets flooded with requests from all LOIC clients, operating in “hive” mode. This is a classic Distributed Denial of Service (DDoS) using a botnet, except that in this case, attackers volunteer to join it. If you are using this tool even for testing purposes, please be careful, because it does not include code for masking the originator’s IP address, which will show up on the target server’s logs and can easily be traced back to the user’s ISP account, and eventually the local router. But if you want to test it on your own servers, the C# code is available at here. In LOIC, most of the files are for creating the interface, but three of them are of interest: frmMain.cs, HTTPFlooder.cs and Program.cs. The frmMain.cs file generates the main part of the user interface, and where the user specifies the URL or IP address of the target server, the program does a series of checks for valid addresses, port numbers, payload, etc., before running the DDoS code for whichever of the three methods (TCP, UDP or HTTP) is selected. In the “hive” mode, commands are sent to the LOIC client through IRC. The IRC server, channel and port are set initially in the forms and defined in Program.cs, which uses the C# SmartIRC4NET library. In LOIC’s default mode, the user has volunteered to join the rest of the LOIC users all over the world, thus forming a botnet, which collectively sends mass requests to the target server. If you face some difficulty in compiling LOIC, you can go for its binary here. However, besides LOIC, attackers also use a variety of other tools. Some of them are available here. Attack packets usually have spoofed source IP addresses. Hence, it is more difficult to trace them back to their real source. Further, it is possible that intermediate routers and ISPs may not cooperate in this attempt. Sometimes attackers, by spoofing source IP addresses, create counterfeit armies. The similarity of the attack traffic to legitimate traffic makes separation and filtering extremely hard. Unlike other security threats that need specially crafted packets (e.g., intrusions, worms, viruses), flooding attacks need only a high traffic volume, and can vary packet contents and header values at will. The easy availability of powerful DDoS tools has made it possible for even inexperienced users to bring down mighty Web servers. Implementing CAPTCHAs can hinder automated DDoS attacks. Though bots are increasingly finding ways to circumvent CAPTCHAs, they are still an effective defense against application DDoS attacks. DDoS attacks are almost always performed by an automated client. Many of these client or bot agents have unique characteristics that differentiate them from regular Web browser agents. Tools/technologies that recognise bot agents, such as malware collectors and honey-pots, can help in botnet analysis, thus improving security. Administrators could adjust their network gateways in order to filter input and output traffic. The source IP address of output traffic should belong to the local subnet, whereas the source IP address of input traffic should not. In this way, they can reduce traffic on the network that has spoofed IP addresses. If you own a Web server, don’t just rely on anti-viruses, but instead use fully updated anti-malware and anti-botnet software too. In this way, you can prevent auto-installation of DDoS toolkits on your system. Moreover, always keep your systems updated and fully patched. Intrusion detection systems (IDS/IPS) can be a great help here in notifying the administrator if someone is trying to break in to install attack toolkits or bots. The limit on the number of simultaneous requests that will be served by Apache is decided by the MaxClients directive, and is set to 256, by default. Any connection attempts over this limit will normally be queued, up to a number based on the ListenBacklog directive, which is 511, by default. However, it is best to increase this, to prevent TCP SYN flood attacks. mod_limitipconn limits the number of simultaneous downloads permitted from a single IP address. More here. mod_throttle is intended to reduce the load on your server, and the data transfer generated by popular virtual hosts, directories, locations, or users. Download from here. mod_bwshare accepts or rejects HTTP requests from each client IP address, based on past downloads by that client IP address. More here. Apart from the above, one module that is designed specifically as a remedy for Apache DoS attacks is mod_dosevasive (Download link). This module will allow you to specify a maximum number of requests executed by the same IP address. If the threshold is reached, the IP address is blacklisted for the time period you specify. The only problem with this module is that users, in general, do not have unique IP addresses. Many users browse through proxies, or are hidden behind a NAT (network address translation) system. Blacklisting a proxy will cause all users behind it to be blacklisted. Hence, it is recommended to keep traffic shaping modules higher in your priority list. (D)DoS Deflate is a light-weight Bash shell script designed to assist in the process of blocking a denial of service attack. Apache log viewer can be used for easy analysis of Web server traffic and requests. Other tools such as zmbscap-0.1 and scrutinizer-1.03 are also effective. You can get a huge list of such tools here. Note: I once again stress that neither I nor LFY are responsible for the misuse of the information given here. Rather, the attack techniques are meant to give you the knowledge that you need to protect your own infrastructure. Please use the tools and techniques discussed in this article, sensibly. We will deal with other dangerous attacks on Web applications and Apache in the next article. By the way, keep an eye on dos-attacks.com for the latest news/information on DoS attacks. Ddos attacks are posing threat to servers..
very useful this is ..